Looking for a 3PL company in New Jersey? Glenway Distribution’s warehouse is is the largest single 3PL facility in the greater New Jersey region. Glenway Distribution has a solution for all your fulfillment needs. Each of our client’s have unique fulfillment needs requiring our 3PL services. Whether fulfillment orders need to be individually picked, bagged, tagged and re-packaged for distribution, Glenway coordinates the process to fulfill your orders. In the case of distribution emergencies, Glenway is close to NJ/NY ports and has the experience to step in to expedite one or more value added services and for order fulfillment. Our warehouse is always available for longer term fulfillment needs. Store your products until they are ready for delivery at Glenway’s 427,000 square foot warehouse. 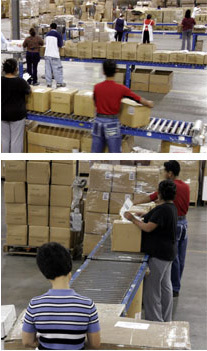 Use Pick & Pack fulfillment services for direct deliveries to your clients.